The trip begins in the Lerma Valley until El Carril, continuing to Chicoana. We enter to the Quebrada de los Laureles (The Laurel’s Gorge) and soon to the Quebrada de Escoipe (Escoipe Gorge). We arrive to the Maray entering Cuesta del Obispo (The Bishop’s Cliff), road with abundant curves from where it is possible to enjoy a panoramic view of the Enchanted Valley and small houses with maize and fruit trees. At Piedra del Molino (The Mill’s Stone) we reach 3.384 meters above the sea level, the highest spot in our trip. Soon Los Cardones National Park is crossed by the straight line of Tin-Tin (ancient Inca’s road). Arriving to Cachi, a panoramic view of the Nevado de Cachi and Payogasta is observed. 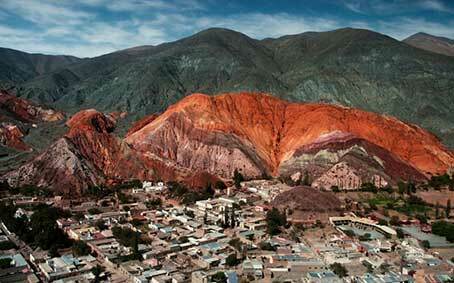 We go the town of Cachi where the Archaeological Museum and the Church are visited. 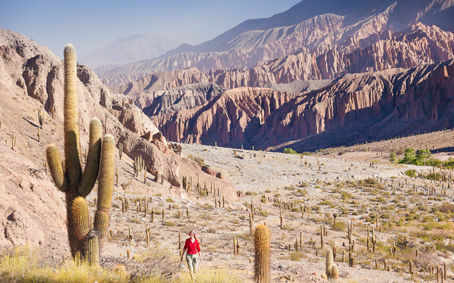 We return to Salta through the same route. This tour performed in 4 x 4 vehicles gives us the possibility of combining three different circuits in the Northwest of Argentina in one day. 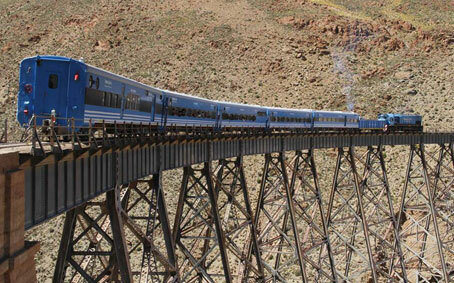 The first one follows the famous railway track of the "Train to the Clouds" through the "Quebrada del Toro" (Bull's Gorge) up to San Antonio de los Cobres. 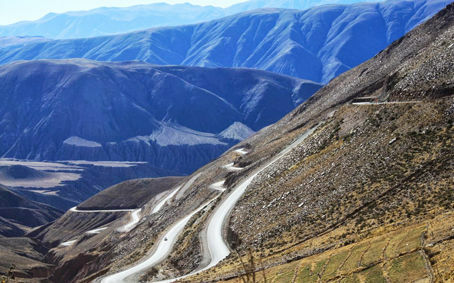 The second one goes through the Puna, along national road 40, up to "Salinas Grandes" (Salt Lakes) of Jujuy, and the third one, the downhill trip of Lipan to the picturesque town of Purmamarca with its famous Hill of Seven Colors. 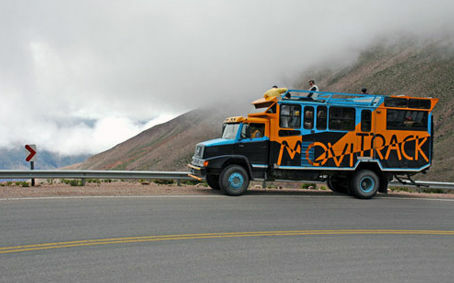 Finally, return by bus to Salta city trough national roads 9 and 34. Early morning departure; first we visit Purmamarca and then Salinas Grandes (Salt Flat). The "salinas" have 212 km2 of extension -the same surface as the city of Buenos Aires- and are located in the Puna at 3,450 m.a.s.l. A white stretch of salt that contrasts with the blue of the sky. 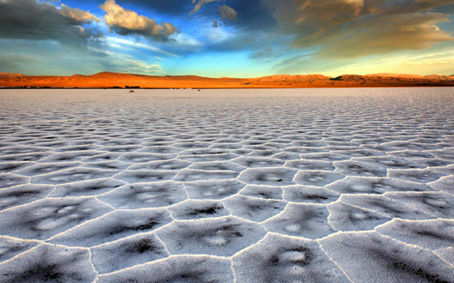 It is a unique natural environment with its traditional artisanal exploitation of salt. The return to Salta is by the same road as the one way. Leaving Salta, we travel along the route parallel to the Train to the Cloud’s railway track, at Quebrada del Toro (Bull’s Gorge), where the scenery will change its dense vegetation till the first cardones will be seen, as well as several viaducts and bridges such as The Bull, Alisal and Chorrillo, getting to know places as El Candado, El Gólgota, Alfarcito, etc. All lonely yet beautiful mountain landscapes. Once at Santa Rosa de Tastil, we’ll be able to visit the village, the Archaeological Museum and the pre Inca ruins where ancient housing and streets can be clearly distinguish. We continue through Finca La Encrucijada, to ascend up Muñano Cliff till to Abra Blanca, at 4,080 m.a.s.l. when we arrive to San Antonio de Los Cobres. It may be reached mostly by land - taking National Road N° 9 - or by air. 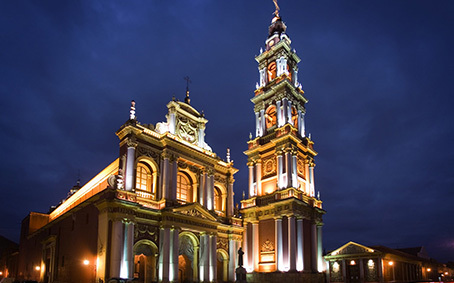 Its capital city having the same name, is 1,605 Kms far from Buenos Aires. In this province, adventure finds an oasis to challenge any expectation: trekking, horse riding, tyrolean crossing, rappel or bungee-jumping over the Cabra Corral Dam, rafting, paragliding at the Cuesta del Obispo, are just a few of the many available options. At the enchanting Puna with villages like Tolar Grande with a valuable cultural heritage, or San Antonio de los Cobres where the time seems to have stopped until the Train to the Clouds passes by, visitors may exchange smiles with local inhabitants, people that adapted themselves to the inclemency of a dry and cold weather, at an altitude of more than 4.000 mts. Salta is a beautiful active city, of a well preserved colonial style, hosting folk parties, the High Mountain Museum (where tourists are told about the famous expedition that found the mummified Inca children at Llulliallaco volcano) and the new gastronomic circuits for those loving the Creole and Andean cuisine. Visitors should not miss either the culture of the Salta's Gaucho, its estancias (cattle farms), its extremely beautiful national parks or the Calchaquíes Valleys (Cachi, Molinos, Seclantás or Cafayate, the latter being the local reference for the Wine Route) framed by gorges of mysterious shapes and colors perpetrated in the infinite. 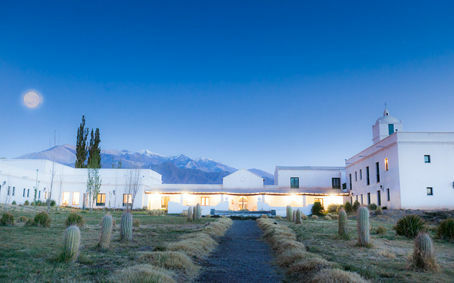 This region is acknowledged by the defined characteristics of their highland wines, born among the highest vineyards in the world (1.700 to 3.000 meters above sea level). 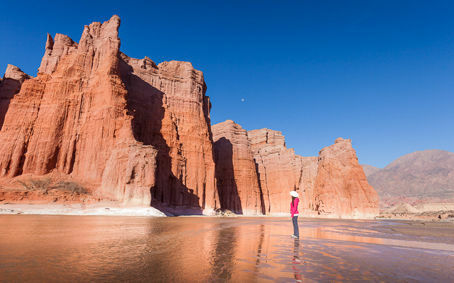 Wineries, Andean gastronomy, boutique lodging and wine therapy are good reasons for not missing a trip to Salta.